P.S. Belton, NMR in Context. M.J. McCarthy and M.K. Cheung, Magnetic Resonance Imaging. X. Zhou, T.L. Peck, and J.B. Litchfield, Magnetic Resonance Microscopy. G.J. Martin and M.L. Martin, Stable IsotopeAnalysis of Food and Beverages by Nuclear Magnetic Resonance. C. Tellier and F. Mariette, On-line Applications in Food Science. M.H. Stevenson and R. Gray, The Use of ESR Spectroscopy for the Identification of Irradiated Food. T.M. Eads, Wide-line and High-resolution in <+>1H NMR of Food Materials. H. Saito, Conformational Characterization of Polysaccharides as Studied by High-resolution <+>13C Solid-state NMR. G.M. Smith, Studies of Protein Structure by NMR Spectroscopy. F.D. Gunstone and V.K.S. Shukla, NMR of Lipids. X. Sun and S.J. Schmidt, Probing Water Relations in Food Using Magnetic Resonance Techniques. N.M. Wahlgren and T. Drakenberg, Milk. J.-P. Renou, NMR Studies in Meat. J.E. Maneval, Applications of NMR to Drying. Chapter References. Subject Index. Over recent years, no other technique has grown to such importance as that of NMR spectroscopy. It is used in all branches of science where precise structural determination is required and where the nature of interactions and reactions in solution is being studied. 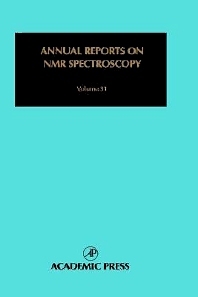 Annual Reports on NMR Spectroscopy has established itself as a means for the specialist and non-specialist alike to become familiar with new applications of the technique in all branches of chemistry, including biochemistry, and pharmaceutics. This volume focuses on theoretical aspects of NMR nuclear shielding and on applications of NMR to polymer science. Graduates, researchers, and practitioners in NMR spectroscopy.